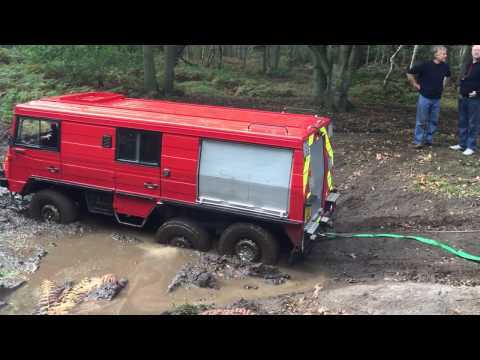 It appears that although there are quite a number of people registered on here that they don't have either a Haflinger or a Pinzgauer (or atleast ones that can be driven). We had 5 Haflingers and 2 Pinzgauers turn up for the weekend of driving off road. 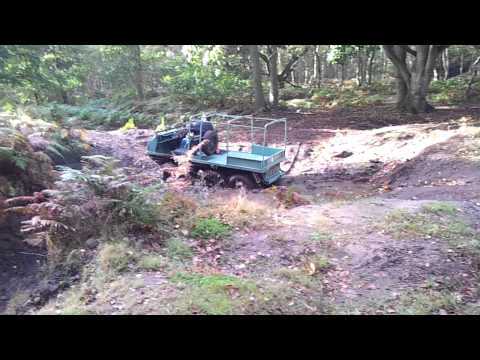 There are plenty of routes which wouldn't test a family car too hard to routes that even 6 wheel Pinz's can get stuck in..... Two Hafi's soon pulled it back out, so you wouldn't get left with you vehicle in a mud hole wondering how you were going to get home. If you brought a vehicle on a trailer, then even less reason not to turn up. I traveled some 400 miles over the weekend in Lurch and the biggest issue? A windscreen wiper that gained a mind of its own - an 8mm spanner out of the tool box soon sorted that. As I have to drive there and back. I tend not to be too adventuress with the off roading in Lurch but that's not say he isn't put in to some sticky situations which require 4 wheel drive and the use of both diff locks! I camped, but there are plenty of B & B's that could be used if you don't fancy a couple of nights in a tent or caravan - nobody has brought one to the last two meetings which i have attended, but then that would mean having to have two main vehicles, one to bring the Haflinger and one to bring the caravan, unless of course you are like the Elliott's who use their Pinzgauer ambulance and trailer. So are we going to see any of you lot turn up at the next one? Any chance of posting a bit of video showing the rescue of the Pinz by two Hafs? Not sure if this site will let you embed video in it, but at least a link could be posted. Might tempt a few of members on here to come and see what happens for them selves. Try the link, it works for me. Works for me as well, very interesting to see it from another perspective. It didn't seem like we were pulling and moving it to start with, but then suddenly we seemed to get grip and out it came. My little bit of video. Great videos, its not " Power to the People " >- its " Power to the Haflingers " ) well done John and Nige' for posting the vids', hope it encourages more to attend our Club Events not only that but there are also links to other vids' of Haflingers and Pinzgauers, Great !!! Ok, I'll see your clip with one taken from another angle! Lots of things to do even if you don't want to drive through mud puddles... Some went to the local shops - Paul's Haflinger became very green at the end of the weekend with all the mud he collected - it even started to grow flowers, or were those bought at the shop? We went on a short road run on the Saturday tot eh coast. Maybe next time we'll see if we can find some Byways Open To All Traffic (BOATS) to drive down.